A young Italian startup present their project Felfil on international giant Kickstarter. It is a plastic extruder that will allow to the holders of a 3D printer to reproduce the expensive printing filament, starting from waste, recycled plastic or industrial pellets. Turin – To self-produce the plastic filament used by FDM 3D printers is the goal of many enthusiasts around the world. Some projects in USA and in Europe were born with this goal. One of the most interesting is the Italian Felfil, developed at the Polytechnic of Turin by Collettivo Cocomeri, a young team of designers who decided to bring their work on kickstarter, in seek for funding for their production. 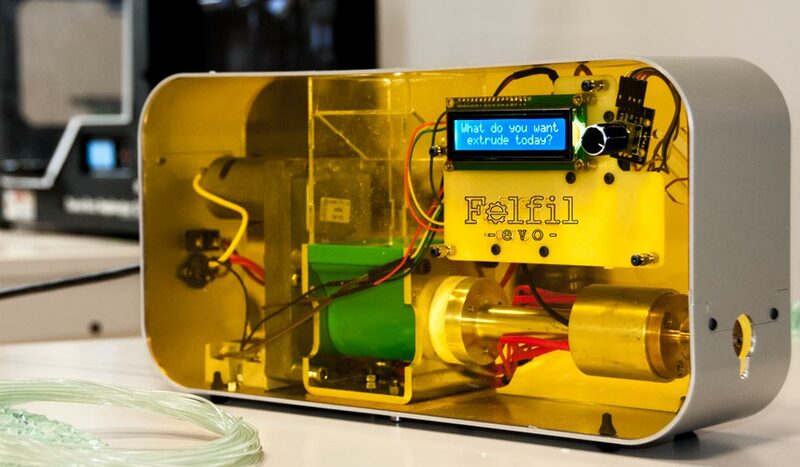 Felfil is a plastic extruder for domestic use, able to produce printable filament of PLA and ABS starting from industrial pellet, printing discards, old models recycled. Its main feature, the one that made it known among insiders, is the fact of being a completely open, DIY and which uses 70 % of recycled components, easy to find all over the world and really cheap. Born as the main topic of Master degree dissertation, Felfil has been downloaded by more than 800 people, not bad at all. The interest of the maker community gave brand new yang graduaters the strength to transform it into a business project. So, Collettivo Cocomeri designed Felfil Evo, the natural evolution of the first Felfil, now supported by i3P, the business incubator of Politecnico of Turin, through the program Treatabit. production in series of two different assembly kit: the complete one, and the basic one. For this reason, as mentioned before, Collettivo Cocomeri started a fundraising campaign on the US website Kickstarter.com. “Evo” means evolution and, in effect, this new product was born from Felfil experience. The development has been so deep that led to the definition of an extremely renewed product. Firstly, the electronic system is controlled by a board compatible with Arduino that allows more freedom for the user who has the desire to experiment, as well as higher ease of use. Secondly, another evolution is the case, carefully elaborated in its design. The plexiglass and the aluminium present a very nice look, making Felfil Evo a great product also to look at. Finally, inside we find out further technical and functional refinements. The hopper is 3D printed, the chamber is made of anodized aluminium and, last but not list, the extrusion screw, specifically lathered, makes Felfil Evo an extremely interesting product, especially considering its price, very competitive in the market. With this extruder the user can produce a filament of 1,75mm or 3 mm diameters of ABS, PLA, and any other material whose melting temperature is below 300 ° and then print in 3D at an extremely low cost. The cost of 1 kg of pellet goes around 5$, while the same quantity in spool form is around 35$. It is a great saving, without taking into account the possibility of reusing the material of old prints or imperfect ones with no cost. Also useful for those who want to experience a new form of domestic recycling, but especially for those who want to carry on trying new geometries and new materials in their printers. You can contribute to the crowdfunding campaign also with scare figures, but spending a little more you will be able to bring directly home the filament extruder at a discounted price. For more information about the campaign and the project please visit the website felfil.com filament extruder and collettivococomeri.com, or follow them on their facebook page.